I received a great email yesterday from reader David Danks relating to the great archive recordings of the Degville band and live music at The Crown pub in Brownhills in the 1970’s. I’m astounded at the huge level of interest shown in this topic, and the dedication of Peter Barker and others in preserving and recalling this hitherto forgotten scene deserves a much wider appreciation. Please, if anyone else has any further recollections or ephemera from this fascinating period in Brownhills history, please don’t hesitate to contact me. BrownhillsBob at Googlemail dot com. Cheers. Thanks to David for the photo and the lovely words. 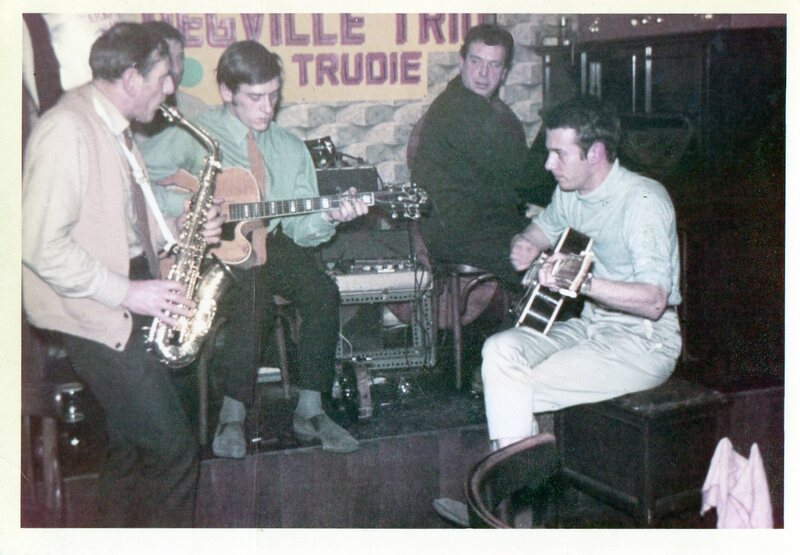 I spent many many happy and musical times there in the mid to late 60s and before that at the Wheatsheaf in Walsall, which of course was the jazz guitar ‘mecca’ and where Paul ‘learned the trade’. Quite a coincidence, it was only last year I came across an ancient photo of myself playing guitar with Paul at the Crown and a rare occasion when Fred played piano for a few numbers. I have attached the photo for you to see and what great musical times we all shared. As often happens, I lost touch with Paul for many years but last year we contacted each other and spent a great day together going down memory lane and of course playing a few of the ‘old ‘uns’. I hope to see him again in the Summer at his new home in Malvern and knowing him and his Mom and Dad has always been very precious to me. Paul Degville and David Danks play together. Picture generously supplied by David Danks. This entry was posted in Brownhills stuff, Events, Features, Followups, Fun stuff to see and do, Interesting photos, Local History, Local media, Local music, Reader enquiries, Shared media, Shared memories, Social Media, Spotted whilst browsing the web, Walsall community and tagged 1970's, Brownhills, Brownhills local history, community, David Danks, Ferrograph, Fred Degville, Ian, Jazz, Ken Rattenbury, Local History, local music, New Photos, Norman Pritchard, Paul Degville, PaulDegville, Peter Barker, Pubs, Staffordshire, The Crown, Wheatsheaf. Bookmark the permalink. srry brian, it’s ernie jones he also played sax. Absolutely super, thank you, and please please keep them coming. To see my Grandad at the piano is great, and my wife says he looks just like me in that pic. I have just read this Paul as my husband is researching his ancestory…what a small world Paul Degville is possibly his cousin and remembers going to see him with Fred at The Crown with his Auntie Ettie and I am Sandra Burgoyne. Hi Sandra, It is truly a small world. Your husband may be related to my late friend Paul Degville, and with the name Burgoyne, you are probably related to me.